Author: Angelika Mietzner. Series edited by: Anne Storch, Norbert Cyffer, Franz Rottland †, M. Lionel Bender †. 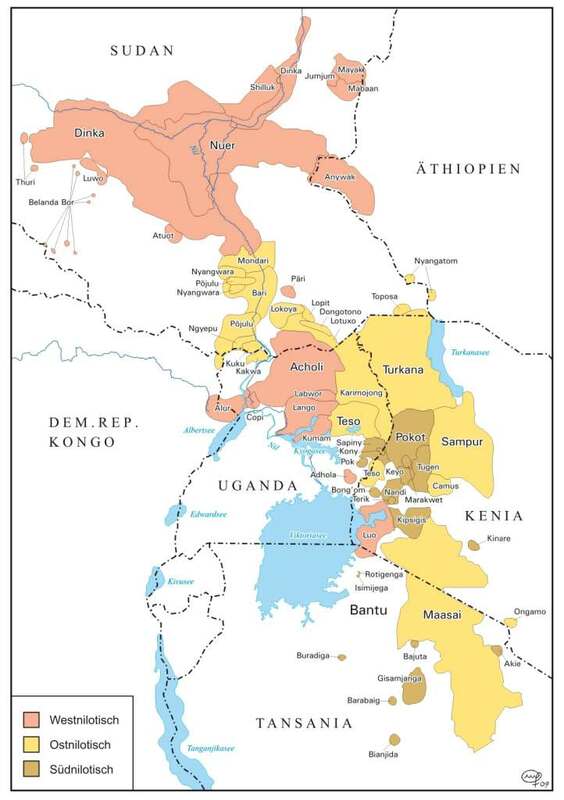 The Nilotic languages appear in a range from Sudan in the North to Tanzania in the South and from Uganda in the West to Kenya in the East. Some of these languages are also spoken in the West of Ethiopia. This comparative study analyzes domains of spatial orientation, directionality and the perspective on their changeability concerning semantic functions. In this way, for example terms for directions in the various Nilotic languages cannot be traced back to one particular Protonilotic form, they rather show distinct lexemes which are dependent on the type of landscape or other characteristics defining the residential area of the speakers. A similar diversity can be seen in form of the verbal morphemes of direction itive and ventive which do not appear exclusively as directional morphemes but implicate semantic functions such as simultaneity or temporal distance as well. These cannot be connected to direction anymore. The verbalization of perspective views, usually described by means of the single-file model and the face-to-face model, is as well a domain of spatial orientation unstable in language contact situations. Out of these – and further – observations emerges a divergency in the domains of spatial orientation. 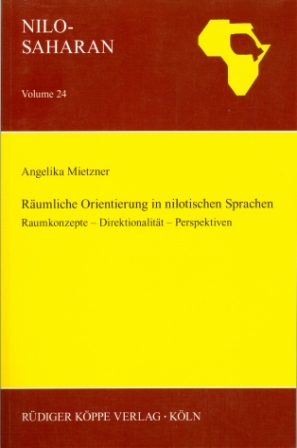 Hence there is no availability of descriptions concerning spatiality and perception for Nilotic languages at hand, the present study also contributes to the descriptive situation of the usage of spatiality and perception in particular Nilotic languages. Die Arbeit von Angelika Mietzner bietet nicht nur einen ausgezeichneten Beitrag zur kognitiven Semantik in den Nilotischen Sprachen, sie gibt auch einen gründlichen und sehr ausführlichen Einblick in Sprachdaten des Ost-, West- und Südnilotischen in den Bereichen Himmelsrichtung, Deixis und der Grammatikalisierung von Direktionalität (Itiv und Ventiv). Das Buch ist sowohl für den theoretisch als auch für den mehr deskriptiv orientierten Wissenschaftler interessant und lesenswert.